Updated March 27th 2019: Fixed broken manufacture product links and replaced with Amazon links. In another 5 years links will hopefully point to newer models, rather than to broken or discontinued product pages. Article originally posted March 2014. Back in January 2014 I ordered my first Raspberry Pi (Model B revision 2). Very soon I realized that there was a host of options to choose from for the required accessories needed to get started. As such, I spent months of research and testing to ensure that I didn’t keep wasting time replacing accessories until finding the best ones. So in this post I’ll provide you with some tips on quality Raspberry Pi accessories. The Raspberry Pi is powered by 5v micro USB. The Raspberry Pi foundation recommends a 1.2A (1200mA) power supply. This is a safe suggestion because on forums and blogs you’ll notice that users with popular 750mA, 850mA and 1000mA power supplies often have issues with random resets and freezing. Don’t fall for the popular cheap chargers especially if lower than 1200mA. Of course, how much current (mA) the Raspberry Pi requires depends on what you plug into it. Also, note that many cheap power supplies deliver less amperage than advertised. To avoid frustration my recommendation is to go with a minimum of a 1.5A 2A power supply. Also see: Raspberry Pi Safe Overclocking. There are a lot of Raspberry starter kits being sold around the web and I’ve found that the vast majority of them include class 4 SD cards. Yuck! If you are interested in performance, you’ll want to go with a class 10 or at the minimum a class 6 SD card. Keep in mind how you will be transferring data from your PC to the SD card, you may need an SD card reader and this takes longer as well with slower SD cards. If you plan on messing around with multiple Linux distros on your RPi then make sure to have multiple cards so you can swap them without having to reformat. Lastly if you’re installing NOOBS then a minimum of 8GB of storage is recommended. Otherwise 4GB is usually fine for most projects. My cards are 4GB, 8GB and 32GB. I once used a 1GB class 4 SD card (had it laying around) with Openelec and found it to be slower. I found the same performance issue with Arch Linux ARM on a 4GB class 4 sd card vs faster class 10. Chances are you already have a keyboard sitting around in your garage, or in a closet along with an old computer. If not, then invest in a wireless keyboard with built in trackpad. I really like the Logitech Wireless Touch Keyboard K400 and Microsoft’s All-in-One Media Keyboard. I used an old wired Microsoft keyboard for months before going wireless. If you prefer smaller wireless keyboards check out Rii and Favi. Choose wisely, everyone has very different preferences and this in most cases will your most used accessory. I started with the smaller Rii and Favi keyboards, they are nice for travel but slow to work with due to size. I would recommend the Logitech K400 for a compromise between size and usability or the Microsoft keyboard for all out usability. There are also other options so pay attention to the layout of keys and compare to your preferences. 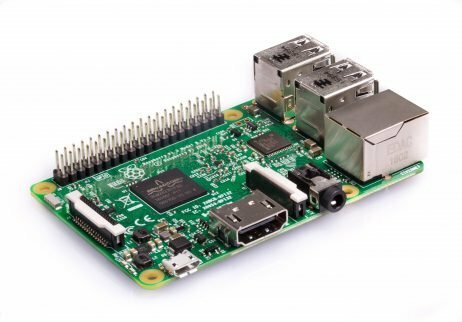 Also see: My Ultimate Raspberry Pi 2, 3 and Zero Starter Kit!